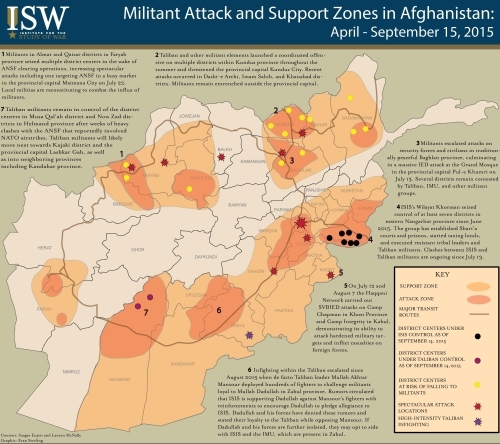 Taliban elements and other militant groups are conducting operations across Afghanistan, including spectacular attacks against major population centers and U.S. bases. The Haqqa­ni Network, a Taliban aligned-group, continues to pressure the ANSF and NATO forces with spectacular attacks in Kabul and Khost. Taliban elements are also conducting numerous ground assaults to seize district centers, especially in northern and southern Afghanistan. These campaigns comprised the 2015 warm weather from April 2015- September 2015. There have been several notable developments following the announcement of the death of Mullah Omar onJuly 29. First, Taliban militants have claimed control of two district cen­ters in Helmand on August II and August 26. Second, ISIS’s Wilayat Khorasan have claimed control of seven district centers in Nangarhar over the course of July and September. Third, Taliban infighting has escalated as different factions compete and express varying positions on who should lead the Taliban movement. Taliban factions are clashing in Zabul province, a historic safe haven for multiple groups including the Islamic Movement of Uzbekistan (IMU) and al-Qaeda. ISIS is reportedly rein­forcing one faction under the leadership of Mullah Mohammed Dadullah, in a likely attempt to encourage the faction to defect. ISIS has already received pledges of allegiance from the (IMU), which is likely also active in the area. Drone strikes against al-Qaeda in neighboring Paktika province in September indicate that al-Qaeda may also be reinforcing the opposing Mullah Akhtar Mansour faction of the Taliban, which increases the stakes of Taliban infighting as well as the overall threat level in Afghanistan. 1.) Militants in Almar and Qasair districts in Faryab province seized multiple district centers in the wake of ANSF clearing operations, increasing spectacular attacks including one targeting ANSF in a busy market in the provincial capital Maimana City on July 22. Local militias are reconstituting to combat the influx of militants. 2.) Taliban and other militant elements launched a coordinated offensive on multiple districts within Kunduz province throughout the summer and threatened the provincial capital Kunduz City. Recent attacks occurred in Dasht-e Archi, Imam Sahib, and Khanabad districts. Militants remain entrenched outside the provincial capital. 3.) Militants escalated attacks on security forces and civilians in traditionally peaceful Baghlan province, culminating in a massive IED attack at the Grand Mosque in the provincial capital Pul-e Khumri on July 13. Several districts remain contested by Taliban, IMU, and other militant groups. 4.) ISIS’s Wilayat Khorasan seized control of at least seven districts in eastern Nangarhar province since June 2015. The group has established Shari’a courts and prisons, started taxing locals, and executed resistant tribal leaders and Taliban militants. Clashes between ISIS and Taliban militants are ongoing since July 13. 5.) On July 12 and August 7 the Haqqani Network carried out SVBIED attacks on Camp Chapman in Khost Province and Camp Integrity in Kabul, demonstrating its ability to attack hardened military targets and inflict casualties on foreign forces. 6.) Infighting within the Taliban escalated since August 2015 when de facto Taliban leader Mullah Akhtar Mansour deployed hundreds of fighters to challenge militants loyal to Mullah Dadullah in Zabul province. Rumors circulated that ISIS is supporting Dadullah against Mansour’s fighters with reinforcements to encourage Dadullah to pledge allegiance to ISIS. Dadullah and his forces have denied these rumors and stated their loyalty to the Taliban while opposing Mansour. If Dadullah and his forces are further isolated, they may opt to side with ISIS and the IMU, which are present in Zabul. 7.) Taliban militants remain in control of the district centers in Musa Qal’ah district and Now Zad districts in Helmand province after weeks of heavy clashes with the ANSF that reportedly involved NATO airstrikes. Taliban militants will likely move next towards Kajaki district and the provincial capital Lashkar Gah, as well as into neighboring provinces including Kandahar province. Sagaar Enjeti is a National Security Policy and Data Analyst and a contributor to the Institute for the Study of War. Lauren McNally examines security and political dynamics throughout Afghanistan. Before coming to ISW, she interned at the U.S. Department of State and worked on security assistance programs to Afghanistan and Pakistan.